Who doesn’t like to dominate target keywords on the first page of search engines? There are more than 200 factors that Google uses to rank websites and two of them have the most influence. The first one is content and the seconds is backlinks. You can create killing contents which provide high value to users but how to analyze or find competitor’s backlinks? Ahrefs is one of the best tools to analyze competitors backlink profiles as well as can be used to monitor any website’s backlinks. But it is a little bit costly which urge most of the users to look for ahrefs alternatives. If you’re in SEO field for a long time, you might know that all the best SEO tools offer the quite similar prices as Ahrefs. It is an all-in-one solution for digital marketing and pouring out the competitive data which makes it a great ahrefs alternative. After adding the competitor site just head over to Organic Search Positions from the sidebar. Now you will see keywords along with search volume and ranking in search engine. SemRush also enlists the keyword difficulty of each keyword. By this way, you can make the best use of Semrush and grab the valuable keywords. It also describes that what are the latest movements of your competitor keywords in search engines. And by putting a single competitor domain name Semrush list out the other potential competitors and thus helping you design more competent SEO strategies. Another significant feature which is very useful if you know about your targeted audience is the choice of location. The tool supports more than 100 locations. Now if you select the US then it will crawl and show information only about the US audience. After getting the information just add your project in SEO audit, this will help to improve on-page SEO. SEMrush can assist you in planning PPC. With this just one tool, you can perform advertising research and analyze the competitor ad strategies. Their PPC keyword tool greatly helps you to outline the Adwords campaign. Along with the Display ads, you can keep an eye on the competitor video ads and plan your own. Recently they introduced keyword magic tool which is the combination of several integral research tools and provides very comprehensive details. Here look at the screenshot. Unfortunately, both ahrefs and Semrush are not a software’s that everyone can afford. But unlike the ahrefs, Semrush offer a free account that provides up to 10 queries per day. Furthermore, you can also get 14-days trial account. While on the other hand, ahrefs do not provide free account and for a trial account, they require the payment details. Semrush is one of the great tool and if you can afford then you must use it. But if you are just a beginner blogger then you may not need this and can rely on their free account. Overall, SEMrush is a great tool with tons of features that present the reports in different formats and surely worth your every penny. SEO Power Suite offers a software based program instead of the online web tool. For using their services, you need to download their software on your local computer and then install it. It is available for Windows, Mac, and Linux. SEO Power Suite is trusted by more than 500k users. The Rank Tracker helps the user to monitor position in Google, Bing, Yahoo and more than 327 search engines. Just add the site address and then connect your Google Analytics or Adwords account. It will begin analyzing. The good thing that you can add 10 more websites along with your site which could be your competitors to estimate the progress differences. With a single click, you can get the latest ranking results or just set it to Auto-pilot to track ranking. The tool can track the ranking in a specific location. The rank tracker can be a very useful tool to dig up the profitable & valuable keywords for your campaign as it consists of 16 various suggestion tools such as Google Keyword Planner, Keyword Discovery tool, and SEMRush, etc. This makes it a great keyword researching tool and thus a best alternative to ahrefs. Furthermore, you can export customized reports with graphics. the number of competing sites, etc. SEO SpyGlass is the most remarkable and one of our favorite tool in SEO Power Suite. After adding the site in SEO SpyGlass, it will display a summary view of the total number of backlinks and domains where the links are coming from. It also indicates the amount of unique IPs. The details that are being presented by the SpyGlass makes SEO Power Suite the perfect tool in the industry. Its algorithm gives you a detailed insight about the latest backlinks with follow and nofollow tags. By moving to various tabs you can get details about backlinks from the homepage, backlinks traffic and Link plenty risk, etc. There are also insights about linking domains and anchors. So with these in-depth and crucial details, you can build an adequate link building strategy. Moreover, it can generate friendly Sitemap and monitors the effectiveness of your social profiles. Power Suite’s link assistance tool can find the link building opportunities. The links are given with various metrics like anchors and quality factor. It can assist you to find the authoritative sites with links out to your competitors. In this way, you can approach them too. Also, it monitors your backlinks and can tell you if those are delivering some value to your site or not. Link assistance tool serves a neat and clean interface for email services. So when it comes to pricing, SEO power can make a serious hole in pockets for budget conscious bloggers and business owners. The professional plan comes in $499 while Enterprise plan cost $1199. The main difference between these two plans is that Professional plan can’t allow exporting some reports for clients. All in all, the tool might be expensive for you, but it is an excellent all-in-one choice for link building, backlinks analysis, and researching. You must try it. As to backlink analysis, Serpstat analyzes your backlink profile, monitors new and lost backlinks, shows your anchors, and measures the link’s authority. Also, it researches competitors backlinks. With this feature, you can find out which sites and pages are linking to your competitors, estimate their link building strategy, and grab some ideas or websites to your own strategy. Related Keywords: This feature provides you with a huge list of keywords semantically related to your primary keyword (LSI keywords). It helps you extend your keyword list with synonyms, different variations of phrases to optimize one page for multiple keywords and make your content look more naturally. Search Suggestions: When you start typing your query into the Google search, Google suggests common keywords people search at Google. Serpstat gathers all these long-tail keywords for you. Search Questions: These are search suggestions in the interrogative form. Keyword Difficulty: This metric shows how competitive the keyword is. With this information, you can understand whether the KW is worth spending money and time. Keyword Intent: The tool shows which special elements are shown for your query (map, answer box, shopping, etc.) It may help you find right KWs to get featured there. Keyword Clustering: Clustering groups keywords by meaning and relevance. This one helps optimize one page for multiple queries and make sense of a huge keyword list. Competitive Keyword Research: You can compare your URL and URL of your competitor and find SEO/PPC keywords you’ve missed. Another great tool is Rank Tracking. You can set up daily, every 3 days or weekly updates. What is more, you can monitor your positions side-by-side with your competitors’ positions in one project, without having to create additional projects and spend extra limits. The Site Audit tool estimates the level of site’s technical optimization. Serpstat finds all errors related to metadata, headings, HTTP status code, indexation, links and redirects, loading speed, server parameters, etc. It sorts errors by priority, gives you a list of links where the errors are located, and recommends a way to fix them. Additionally, you can estimate competitors’ PPC ads, find examples of ads, find keywords they’re bidding on, compare ads of several domains. Almost every feature of this tool is suitable for a competitive analysis as well as for analysis of your own website making it the most suitable Ahrefs alternative. Free version is available but it’s limited in features, queries per day and results per report. The paid versions start at $19/month but the cheapest plan is usually not enough for a proper analysis. Other plans for personal use cost $69 – $299 monthly, for business use it’s $499 – $2,500 monthly. Since plan B ($69) is quite enough to run and optimize several sites, Serpstat appears to offer one of the best price-performance ratio on the market. Moz is the exceptionally well-known tool and considered as the strong ahrefs alternative. Moz started its journey in 2004 as SEO consulting company, but now they offer multiple products. It is heavily used by the small to expert level bloggers, developer, and businesses for better SEO and keywords explorations. Their most popular metrics are the Domain and Page Authority scales from 0-100 which is measured by considering the multiple factors. A website having high authority means it has high influence. They also offer a Moz bar for all of their users. You can install the toolbar from Chrome store. It will show important metrics such as Domain and Page Authority stats below each Google search results as well as backlinks. This is very helpful to check that how influential the players ranked on the keyword you typed in Google. Moz open site explorer attracts most of the users either free or premium for signing up Moz subscription. They have a huge index size and also increasing it with schedule updates. For examining the linking profile, just put the site address in the bar and press Enter. It will display all the links that are coming to that website. Moreover, it tells the nofollow tags, spam score and anchor text of each link along with domain and pages authority metrics. 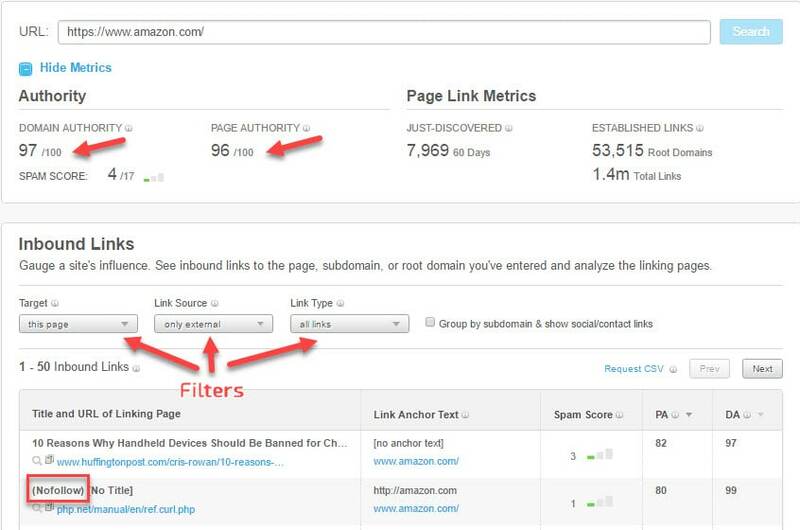 By getting these pieces of information, you can spy on your competitor’s profile and decide how strong linking you need for ranking. With this tool, you can either check the inbound link profile of a post or a whole site. Furthermore, they allow you to apply filters for particular type of information like show external link or internal links or both. Also, you can filter the 301, 302, follow, nofollow, equity, no equity links or links to subdomains and root domain, etc. Now with so many information, you can design a path that from where you need backlinks and how influential the links should be. The link opportunities feature also play a significant role by showing 302, 4xx, 5xx. Another fantastic feature is the link intersect that help you find the sites which are linking to your competitors but not to you. Make the best use of their keyword explorer before writing blindly on any keyword. Type the keyword in the keyword explorer bar then it will show monthly search volume, difficulty and opportunity rate. Opportunity rate refers to the estimated click-through rate. Also, there is priority level gauge where higher score keywords are considered more preferable. Keywords Explorer also provide a very long list of suggestions and a SERP analysis. Moz Pro plan includes Page optimization and rank tracking tools. The page optimization generates the reports based on the 27 different on-page factors and gives SEO score. You can improve the SEO score by following the recommendations. Moz also provides Followerwonk for monitoring the social profile. For API developers they provide Mozscape API in three different plans. You can sign up for a free account which is limited to 5 quarries/day for keyword explorer tool while site explorer works limitlessly. They charge $99/mo for the standard (basic) plan for up to 2 users and 24/7 support services. You can freely choose the plan by considering your pocket and needs. Moreover, Moz articles are very helpful for SEO learning. Moz is an impressive tool that greatly helps you to explore the new keyword and analyze the competitors and thus help you in devising an effective planning to outrank them. And a powerful API for developers. There are also browser extensions. At dashboard, you will see site explorer bar where you need to put the site address about which you need insights. Now at one dashboard, it will show you external backlinks, referring domains and anchor text details. It will point out the Government and Educational links separately. For more details, you need to click on the tabs. Like in Backlinks tab the program show all the follow and no follow links and from where these links belong. You can either hide or show the deleted links. The great thing they allow you to export backlinks data to your local drive. Majestic show information based on the two index features known as Fresh and Historic. The Historic index option gives comprehensive details based on all the data they have while Fresh index gives the information of last 90 days. These options make your back-linking strategies more productive by providing the historic and latest backlink history of your competitors. Let us clear one thing that majestic does not offer SEO services. Mostly the beginner level bloggers pursuing the basic details like estimated keyword volume, ranking difficulty, keywords position tracking, data about organic traffic, and related keywords, etc. but majestic lack all these things. So what is Majestic good for? It can perform better backlink analysis with different metrics like Citation flow, Topical flow, and Trust flow. They have a rich index of backlinks. Trust Flow: Define by the number of clicks on the URL given on the trusted site. Citation Flow: It mainly determines the number of backlinks and their effect on the domain. Topical Flow: It measures the influence of the URL in the specific category. Majestic Bulk Backlink tool helps you to analyze up to 400 URLs at once. It is best when you want to analyze your multiple competitors. To stand against your competitor you also need backlink profile similar to them. Here Clique Hunter tool can help you. If you add three competitors URLs, then it will show which common site send a link to all of them. Majestic got a long list of features including Buzzsumo, Neighbourhood Checker, and URL submitter, etc. You can get a free account of Majestic, just provide necessary information and sign up. Although it is limited in features but can be good for very basic analysis or testing their services. The “Lite” plan only cost $41.67/year which is limited in features while “Pro” plan includes tons of functionalities and cost $83.33. Majestic is a fantastic tool if your main aim to monitor backlinks. Screaming Frog is one of the top alternatives to ahrefs because of their long list of features and detailed information. It is also being used by big brands such as Apple, Disney, and Amazon, etc. Their amazing SEO spider tool can be installed on your Windows, Mac, and Linux systems and with this one tool, you can crawl real-time results. Just add the URL in the software and click on Start. In a free version, it can crawl 500 links while premium plan scans unlimited links. By switching between various tabs, you get details about internal & external links, H1, H2, Meta Description, and Page titles. Furthermore, it also shows the links with HTTP and HTTPS protocols. Screaming Frog is the best way to save time while taking care of the on-page SEO factors. You can easily find the outbound and inbound links along with the URLs. The SEO spider identifies the permanent and temporary redirects. Also, it provides follow and nofollow tags for links. For older sites, broken links are a headache and these can kill your site SEO. SEO spider not only points out 404 pages but also 301. Thus you can take action to fix the affected links quickly. When the software finishes crawling to 100% then just head over to “Response Codes” tab and apply Client Error 4xx filter. Now for finding the broken links source click on the Inlinks tab given at the bottom of the software. One of the primary element is that it can fetch the Google analytics as well as Search console data and present all of their information at just one dashboard. You can easily export the customized sitemap. Auditing hreflang attributes and Ajax, etc. Among all this, in a premium version, a technical team is always there for your assistance. You can avail user guide from their website in case of any difficulty. The Screaming Frog also offers many other services like search engine optimization, link building, and PPC management, etc. but for such features, you have to pay additional amount. The spider tool can’t provide the stats like keywords suggestions, search volume, and competition, etc. rather it focuses on optimizing your site to make it search engine friendly. Currently, it comes in £149.00 with all of their features enabled. Screaming Frog SEO Spider is a must have a tool that includes lots of things for SEO at one place and thus save you lots of time. You can export the data to a spreadsheet and other standard formats. No matters you are a blogger or an SEO agency, it will, of course, deliver more than the money you pay. In our view, these are some of the best ahrefs alternatives. But the choice totally depends on your requirements. Like if your main concentration to keep a keen eye on the competitors linking profile then Majestic is a magnificent tool to try as they have a massive index and so provides an in-depth analysis. For an all-in-one solution, SEO PowerSuite is a great choice. Their rank tracker tool works with the collaboration of 16 various tools. Their SEO SpyGlass is a fantastic tool with so many statistics while the site auditor can provide useful information for on-page SEO. But their pricing is sky high which may a major deal breaker for most of the customers. So what is the best which covers all the crucial factors and proves a handy SEO tool? For this, we recommend you go for SEMrush because of their multi-functional tools. You can spy on your competitor’s moves, get a long list of possible competitors, keyword difficulty & tracking, planning Display & Video advertising and support more than 100 locations. Moreover, they offer competitive pricing and 14 days free trial account. So these are suggestions. Feel free to share that which one proves the best ahrefs alternative for you. We highly appreciate your feedback. I’m using the SEO Powersuite, and this thing is a bomb for its zero price! Although there are some limitations in the free version, still, it’s worth it. We recommend try their Pro version, it comes with lots of features and benefits. Though it is expensive but you buy when they offer discount offer. Most Welcome Ethan. Please do share this article on Facebook and Twitter. Thanks for sharing this best SEO tools list, some of these tools providing the free trial feature that help in finding keywords. I am glad that you liked it 🙂 Please keep visiting. I found SEO Power Suite very useful and even free plan offer a lot. Thanks For sharing such a nice article. i am beginner in blogging and it helped me a lot. Great article, it helpful for keep it up …you are doing such a great job! All of them have kept a limit on the number of backlinks they show in their free versions, perhaps semrush is the most generous among the lot. You have created such a great list of SEO tools. Actually, I am confused between Semrush and Majestic. So I just want to ask you that which one you suggest? Choose Semrush, it’s way better than Majestic.